The Model Body Corporation was a small Detroit-based body manufacturer that specialized in the production of sample automobile bodies for Detroit automobile manufacturers who couldn’t afford to have their own prototyping departments. They provided services similar to those provided by Creative Industries and ASC in more recent times. The creative force behind the operation was George J. Mercer (b. Feb., 1869-d. Nov. 23, 1952), one of the most talented body engineers an designers of his day. George John Mercer was born in England in February of 1869 to George and Emily (Newman) Mercer. In 1876 the Mercer family emigrated to the United States, locating in Eastern Pennsylvania where young George was attended the local schools. He was apprenticed to a carriage builder who sent him to New York City to attend the CBNA’s (Carriage Builder’s National Association) Technical School for Carriage Draftsmen and Mechanics, graduating in 1893. He worked for a number of years as a draftsman and designer in several of Manhattan’s largest shops, becoming well acquainted with Jacob H. Klein, The Hub’s resident technical editor / carriage designer / draftsman. Published from 1858-1919, ‘The Hub’ was the nation’s earliest and longest running monthly trade publication for carriage builders. It was succeeded by ‘The Automotive Manufacturer’ in 1919. George J. Mercer and Annie Alma Cowper were married in Manhattan on October 27, 1897, their marriage certificate lists George’s parents as George and Emily (Newman) Mercer; Alma’s as Fred L. and Flora (Donyles) Cowper. The 1900 US Census lists the couple at 439 West 99th Street,21st Ward, Borough of Manhattan, his birthdate February, 1869 in Pennsylvania, his occupation, carriage maker. Alma’s birthdate is given as September 1866, in England, her emigration year as 1886. “George J. Mercer (b.1875, immigrated from England in 1876), his wife Alma, (b. 1872, immigrated from England in 1890) his occupation, designer of automobiles"
The two friends (Jacob H. Klein and George J. Mercer) were both graduates of the CBNA’s (Carriage Builder’s National Association) Technical School for Carriage Draftsmen and Mechanics, and were active in its Alumni Association which was formed in 1904. At that time the Alumni Association’s officers included: Andrew F. Johnson, president; Walter C. Yelton, vice-president; Jacob H. Klein, secretary and treasurer, and George J. Mercer, historian. To the best of my knowledge Klein & Mercer was the nation’s first free-lance automotive design firm. The pair’s Columbus Circle office was located in the heart of New York’s automobile row at 1777 Broadway, New York, NY, one block north of A.T. Demarest’s new 9-story manufactory. Mercer’s partner, Jacob H. Klein, was born in Weehawken, Union Township, Hudson County, New Jersey, in May 1870 to Matthias (b. in Germany) and Elisabeth (b. in Switzerland) Klein. He was named after his uncle, Jacob Klein, who worked as a blacksmith and introduced him to the carriage trade. Living in the same house was his uncle Jacob (28-yo, b. in Prussia), a blacksmith, his aunt Joan (24-yo, born in New Jersey) and their daughter Anna M. Klein, 2-yo, born in New Jersey. The 1900 US Census lists Jacob H. Klein’s home address as 1020 Eleventh Street, Hoboken, Hudson County, New Jersey, his occupation, draughtsman. States he was born in New Jersey in May, 1870 to two German immigrants, as was his wife Elizabeth (b. May 1872). The couple had two children; Raymond L.(b.1900) and Marie E. Klein (b.1905) and their listing in the 1930 US Census lists their home address as 1124 5th Ave., North Bergen, Hudson County, New Jersey with Jacob’s listed occupation as draftsman, automobile bodies. Both partners had spent many years honing their skills in the drafting departments of Manhattan’s finest carriage builders, and were occasional guest lecturers at Andrew F. Johnson’s carriage drafting classes. Klein & Mercer’s central location put them in walking distance of most of Manhattan’s high class automobile distributors. The pair could meet with a prospective client at the distributor’s showroom and have a sketch ready within 24 hours. 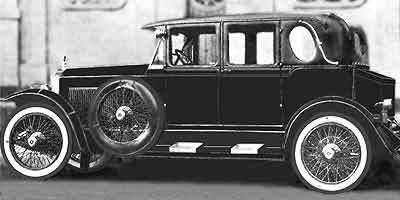 Upon approval, the required body drafts would then be completed within a couple of days, after which they would be delivered to a metropolitan New York coachbuilder of the customer’s choosing. Klein & Mercer were not the only freelance body designers in Manhattan at that time. George W. Cole, George P. Harvey, Leon Rubay and J. Franklin deCausse offered similar services during the teens, which ultimately led to the establishment of the world-famous LeBaron Carrossiers in 1920. Mercer remained in Manhattan until 1918 when he relocated to Detroit to become a consultant for the Saxon Motor Car Company. Mercer continued to freelance, and maintained a separate office in the Stormfeltz-Lovely Bldg, 7310 Woodward Ave. at Grand Boulevard, Detroit. When he wasn’t busy designing automobile bodies, Mercer spent his spare time writing about them. Between 1910 and 1942 Mercer published well over 1,000 articles in the nation’s automotive trade magazines, and wrote 3 definitive technical books; Motor Body Engineering (1928), Motor Body Designing Problems (1931), and Motor Body Blue Print Technology (1933). He was a frequent contributor to The Automobile (aka Automotive Industries), SAE Journal, Autobody, Autobody Trimmer & Painter, Autobody & the Conditioned Car, Automobile Trade Journal, Motor Body, Paint and Trim, etc. Mercer joined the Society of Automotive Engineers in 1915 and was active in the organization for the next three decades, many of which were spent as head of the SAE’s Standards Committee. He also kept in touch with his former friends from the CBNA’s Technical School, as a director of the Andrew F. Johnson Society (aka The Johnson Club), and served as president of the Alumni Association of the Technical School for Automobile Body Designers and Engineers. In addition to his automotive body work, Mercer ventured into other automotive-related activities and designed a brake testing machine for the Bendix-Cowdry Brake Testing Company in 1933. After his retirement in 1942, Mercer was instrumental in acquiring Andrew F. Johnson’s massive reference library for the Detroit Public Library’s Automotive History Collection. Also included was Mercer’s personal collection of manuscripts, letters, photographs, engineering drawings, etc., of carriages, automobiles, trucks and other vehicles. The 1920 US Census lists him at 42 Winder St., (b. 1870 in Pennsylvania) district 6, Detroit, Wayne County, Michigan, occupation Automobile Designer. While Mercer continues to be well-known as a body engineer, he should also be given credit for helping to found the nation’s first prototype and experimental coachwork facility, the Model Body Corporation. Like Mercer, Andrew Sauter (b.1885 in Germany emigrated in 1909), was a well-known automobile body builder, engineer and draftsman (1920 US Census, body builder, auto factory)(1930 US Census Body Engineer, auto factory) ( 1940 Census, draftsman, auto plant). The firm’s secretary-treasurer, Charles Lester French (b.1895 in Detroit), had no experience in the field, his expertise was accountancy, and prior to founding Model Body Corp., he occupied a position as bookkeeper in the Dime Savings Bank. His father, George S. French was vice-president of the Houghton & French Ice & Coal Company, Detroit. “DETROIT, May 1 — The Model Body Corp. has increased its capital stock to $110,000, and is issuing $50,000 in cumulative 7 per cent preferred stock at $40, which will be non-redeemable and fully participating with the $60,000 common stock. The company will double its present factory space and make several important additions. Model Body has been specializing in custom body work, ambulance bodies and bus work, but is planning to undertake production for several important passenger car companies. The officers of the company are G.L. Gast, president; Andrew Sauter, vice-president; G. Lester French, treasurer, and George J. Mercer, secretary and general manager. Claude B. Talbot (b.1886 in New York) was prominent in the Detroit lumber business, owning the C.B. Talbot Trustee Co., a large wholesale lumber house. He was also involved in finance serving as Pres. of the Standard Discount Corp. and V-pres., Peoples Mortgage Corp.
As the firm specialized in the production of sample automobile bodies for Detroit automobile manufacturers very few of their projects were discussed in the trades, one notable exception being a flexible closed body system developed by Kenneth L. Childs. For a number of year Childs was the Manhattan representative of the Standard Textile Products Co., a Youngstown, Ohio holding company that operated oil cloth mills in Akron, O., Newark, N.J., Athenia, N.J., Montrose, N.Y., Astoria, L.I., Norristown, Pa., Columbus, Ga, and Mobile, Al. Apparently Childs had been experimenting with fabric-covered bodies in his spare time, first with California-topped touring cars in 1919 then later with closed coachwork. Childs believed that fabric would eventually replace sheet metal as it offered lighter weight and less upkeep, for less money. Unlike Charles Weymann’s Flexible Body System, whose wood framework was specially constructed using moveable metal plates, Childs’ system utilized standard composite body wood framing, substituting a padded nitrite coated fabric in place of the standard sheet metal skin. Childs organized the Fabric Body Corporation, 12-244 GM Bldg., Detroit, in early 1923 hoping to sell licenses for fabric bodies constructed using Meritas cloth, a product comparable to Zapon and Rexine and manufactured by Standard Textile Products Co. at its Columbus, Georgia mill. "Childs isn't an automotive man but he's drawn on his background for a new body of outstanding originality." Coincidentally The Fabric Body Corp. and George J. Mercer’s offices were both located in Detroit’s Stormfeltz Lovely Bldg. during the late Twenties. Childs took to the road in 1923 with a fabric-bodied Packard built for him by the Model Body Corp. The Packard was an eyeful. Every square inch of its body was covered with Meritas cloth - even the fenders, although humdrum pressed steel was suggested for these appendages on production cars. Childs took the car all over the country during the Twenties, exhibiting it at motor shows to prove the durability of its construction. Not everyone was impressed, of course. Thomas Litle, chief engineer for the Marmon Motor Car Company, thought it was "dull and drab" without mentioning the body by name. Louisville, Kentucky’s Mengel Body Company took out a Childs license to build Meritas-covered sedan bodies for Ford Model T chassis that were offered through select Ford dealers. Pictures show a number of the bodies under construction in the Mengel plant. “Auto Plant, Los Angeles, Calif.
"While fabric construction does eliminate two difficult-to-control areas in body production, metal working and painting, experience in lots of five hundred suggests there can be considerable trouble with this construction as well as any other… Hand labor has been the obstacle in the production of fabric bodies, perhaps due to orders which haven't been large enough to warrant special equipment and tools." Few Meritas covered bodies were constructed after 1925, and the Fabric Body Corp. had withdrawn from business by 1928. G.I. McClure and H.M. Will were both Detroit-based lumber executives and the Model Body Corp. The factory was located in a small industrial park located at 7201 Six Mile Rd. The Model Body Corp. last directory listing was in the 1926 Detroit Directory and it’s assumed they withdrew from business sometime during 1926. In 1927 their factory became the home of the Thos. V. Heston Lumber Co, a wholesale supplier of Hardwood — Cypress — B & B Yellow Pine — Sugar Pine — Mahogany and White Pine Pattern Lumber Yard and Mill. The facility at 7201 Six Mile (now E. McNichols Rd.) remains an industrial park, it entry being located to the right of the old two-story brick Michigan Tool Co. (now Pacific Motors) plant at 7171 E. McNichols Rd. The buildings used by Model Body Corp. still exist and are currently occupied by the General Hardwood Company Lumber Yard and Mill. George J. Mercer died in Detroit, Wayne County Michigan on November 23, 1952 at the age of 85; his death certificate states he was born in England in 1867 to George and Emily (Newman) Mercer.